← The time is fast approaching …..
and eat it too!!! 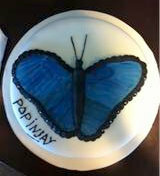 No party is complete without a cake and the launch of Popinjay proved to be no exception! Check out the amazing work done by the lovely Catherine in Linlithgow – it tasted pretty fantastic too!!! A full report on the party will follow once we’ve all had time to catch our breath! Posted on July 27, 2011, in Butterfly. Bookmark the permalink. Leave a comment.